Sunny, Hot--southern California reporting in to wish you a Great Birthday!! Today we salute 'Steve. B'....!!!!! 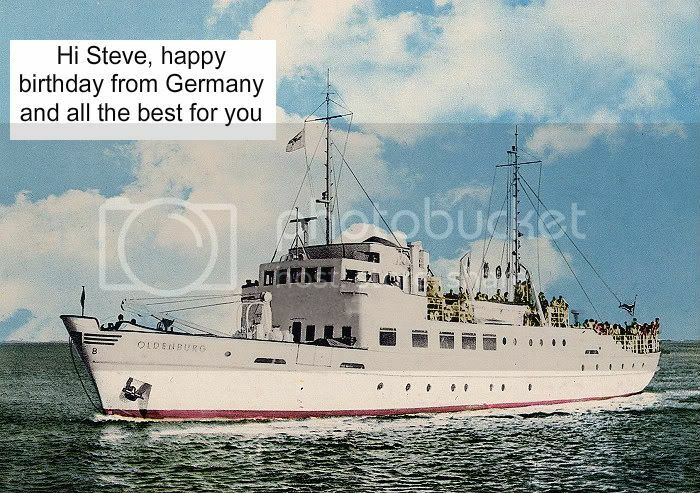 All my best wishes for you Steve!!! Keep on fighting!!! As Seagull flies in for Steve.B’s birthday celebrations, ehp makes a grand entrance in Jim Clark’s 1965 Lotus. Thank you everyone for your kind words, very much appreciated indeed! Seagull, your post made me laugh! Thank you. HAPPY BIRTHDAY to Steve B from all the officers and crew of a HSC sailing in the summery county of Nordland, Norway! Thank you Sir! May all aboard the HSC have a safe and pleasant journey! Almost over - but I gather birthday felicitations are in order to you, Steve B.
Wishing you many more of them. Thank you Paul, just when i thought the celebrations were over, I shall have to go and have another wee drink! 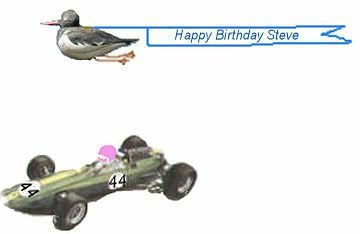 Hi Steve, so sorry- one day for late- but nevertheless happy birthday to you. Thanks Doris, and I love the birthday card! Mr Sterkoder - HAPPY BIRTHDAY TO YOU SIR! Last edited by Steve.B; June 18th, 2009, 01:14. Thank you very much, Steve!!! I'll be off the forum until late Sunday night, as I join a flight to Paris in a few hours. (So you see, I'm sure I'll have a nice day... ).